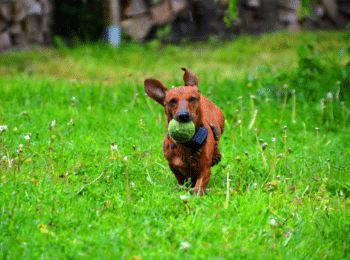 In this Article, we will review how to teach your Dachshund puppy verbal commands and learn how to stop Dachshund Separation Anxiety. 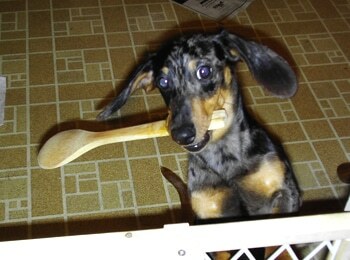 Did you know that you can start training your dachshund basic commands before he is 6 months old? The sooner that you start teaching, the better. Keep your puppy command training sessions short and sweet. Just like young children, puppies have a short attention span. Don’t let training go on too long. Let’s start with the “Sit” training command. Have your dachshund positioned directly in front of you. Have a small treat (dog food, kibble, small dog treat) ready for positive reinforcement. Hold that small treat above his nose, slowly move it to the back of their head. If he sits automatically, make sure to say “Sit” when he sits. If your dog doesn’t sit automatically, give a gentle push on his hindquarters and say the “Sit” command to help him understand what that command means. When he sits down, verbally praise with “Good” and give him the small treat. Don’t put the treat too far above his nose, you want it reachable (so they don’t have to jump). As you practice, try to have your dog remain in the “sit” position from a couple of seconds up to 10 seconds at a time. It is recommended to do this training a couple times per day for about 2-3 minutes per session. Training Tip: If your training session is not going as planned, go back to the command that your dachshund learned before and end your session in a positive fashion. After your dachshund has mastered the “Sit” command, move on to the “down” command. Have a small treat (dog food, kibble, dog treat) ready for positive reinforcement. Start the dog in the Sit position directly in front of you. Hold the small treat in front of his face (but not too close), and move the treat down to the ground, then give the command “down”. He should lean forward and follow the treat down. Once his stomach touches the ground, verbally praise him with “Good”, and give him the small treat. When practicing the down command, gradually increase the time that the dog is laying down from a couple of seconds to about 10 seconds. It is recommended to do this a couple times per day for about 2-3 minutes per session. Training Tip: The moment that your dog performs the desired command, give them verbal praise or use a clicker signal and a small treat for a reward. This give positive reinforcement. The Stay and Come command can be taught together. 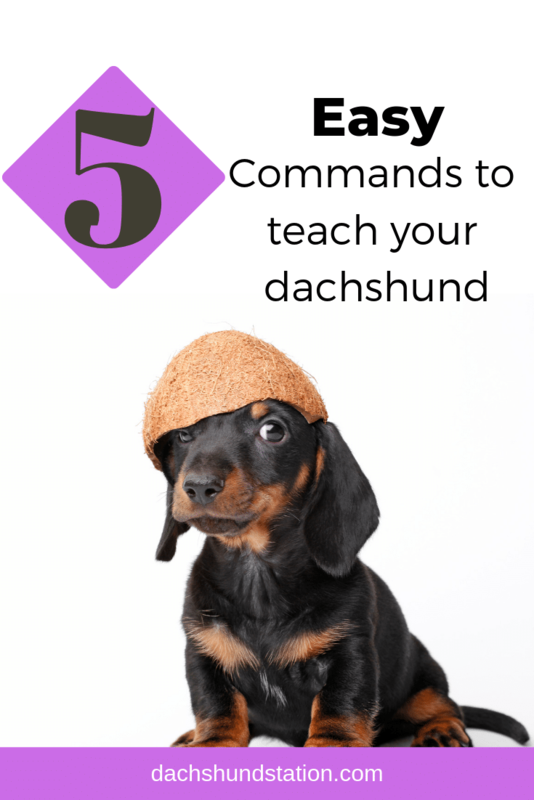 Start with your dachshund in the Sit position and facing you. Then, hold your hand up showing the palm of your had to the dog (like a stop sign) and say “Stay”. If your pup stays in that position for a couple of seconds, verbally give him praise and a small treat. Each time you practice this command, back away from your dog a little further each time and have them “stay” a few more seconds as you give him the “Stay” command. When teaching the “Come” Command, have them in the sit and stay position. Take a step or two away from your dog (still facing him) and say “Come”. If the dog comes to you, verbally praise the dog and give a small treat. It is recommended to do this a couple of times per day for about 2-3 minutes per session. Over time, increase the distance between you and your dog little by little. It is important to Understand Separation Anxiety in your Dachshund. 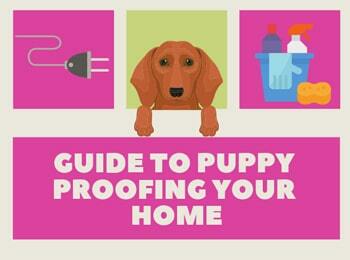 It can be a challenge for your puppy to feel comfortable when you leave the house. Separation Anxiety training is needed to help your puppy learn that you will be back and he doesn’t need to worry or cause mass destruction in the house while you are away. Remember, dogs are pack animals, they love to be around the ones they love and don’t really care to be left alone. 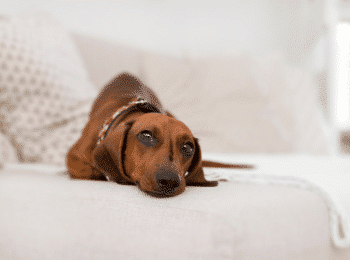 Dachshunds who have separation anxiety will act out in the house because of their instinct, not because of behavioral issues. Punishing them for this act may not do any good. To avoid triggering a separation anxiety episode, make sure to not makeover or have direct interaction with the dog right before you leave. Certain noise triggers like getting your keys out and saying “Good-bye” can set them off. If your dachshund gets whiny when you are ready to leave. Be strong and don’t give in. Check out my article on Puppy Housetraining Tips. Schweitzer, Karen. 2010. Our Best Friends the Dachshund. Pittsburg, PA: Eldorado Ink. Pinney, Chris. 2010, 2000. 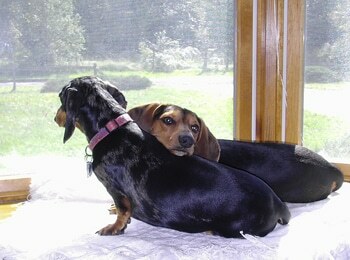 Dachshunds: A Complete Pet Owner’s Manual. Hauppauge, NY: Barron’s Educational Series, Inc.